An awesome addition to the freestyle experience in Steamboat, the Bear River Bike Park serves up medium to expert jump lines along with a honeycomb pump track. The park offers something for the whole family from adventurous youngsters to adrenaline seekers. And, don’t forget your skateboard. The park has a concrete skate park complete with rails and bowls. Built in 2013 and funded by IMBA, Bell Helmets, Routt County Riders and the City of Steamboat Springs, the park is as suitable for families as it is high fliers, featuring two pump-track loops with everything from smooth, kid-friendly berms to big, pro-caliber airs for top level riders. Kids can also get into the action with progressive terrain, from a small pump track to a gradually building lineup of berms and jumps. Funded by IMBA, Bell Helmets, Routt County Riders and the City of Steamboat Springs, the park is as suitable for families as it is high fliers, featuring two pump-track loops with everything from smooth, kid-friendly berms to big, pro-caliber airs for top level riders. Kids can also get into the action with progressive terrain, from a small pump track to a gradually building lineup of berms and jumps. Plans are also underway for the addition of a new skills area to the park. Steamboat Springs BMX track is laid out at the base of Howelsen hill, and the olympic winter training area. The track is 980 feet in length, with three bowl style turns. Steep start hill with doubles, step up, and an eight pack rhythm section. The track is at 6695′ elevation. Five years in the making, the track came about from Steamboat’s BMX club, Team Flying Wheels, aligning with the National Bicycle League. Donations came from SSX Excavating, Wagner Rents, Prestige Property Detailing, private donors and more. The track turns back on itself for four straight shots, each littered with rollers, mounds and berms designed to challenge experts and beginners alike. It also features starting gates, lights and a public address system for a 10-race BMX summer series racing circuit, open to kids and adults. 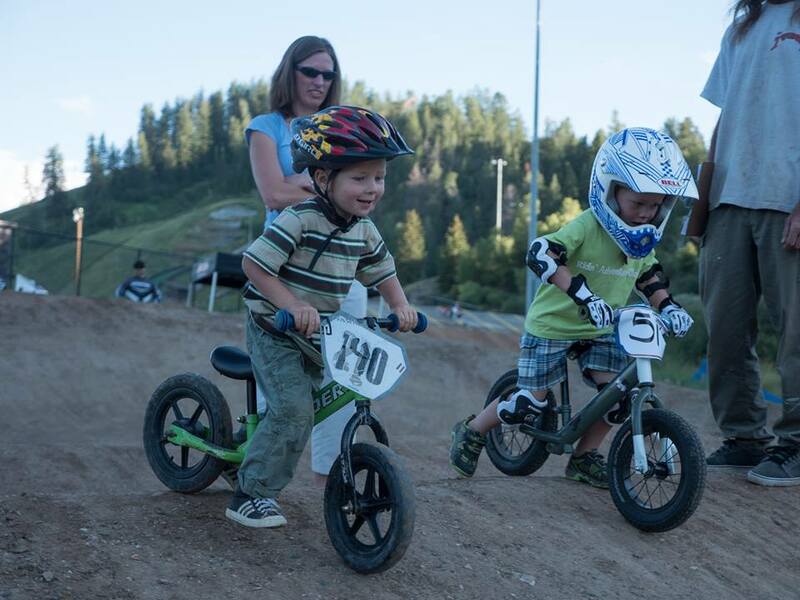 From two-year old learning to balance on the Strider pushbike, to the expert athlete flying over the obstacles with the greatest of ease, to the seasoned rider who still digs the rush of the ride, the Steamboat BMX track is fun for every level of rider. Their UCI Certified coaches will help safely introduce you to the sport, or help you progress to the next level.